talk about the holiday’s origin and why it’s important. You can even consider this time as school (history and social studies). count down the days until Thanksgiving as we prepare various projects (calendar review and math). provide a happy break from some of the more academic things we do. And if you have a child that’s more artistically inclined, even better! The presence of extended family and friends and the chance to make and eat our special Thanksgiving recipes (like our family’s huge pumpkin gingerbread cookies) all make Thanksgiving special. But the chance to consider what we are grateful for leading up to Thanksgiving is a not-to-be-missed opportunity (character training). As far as Thanksgiving crafts go I especially LOVE paper crafts – they are fun for multi-age siblings (and mom!) , inexpensive, and not terribly time-consuming. If you love them, too, here is a must-have book that has simple, inexpensive Thanksgiving crafts that kids (and moms) love to make. This useful Thanksgiving craft book has plenty of patterns and clear, simple, illustrated instructions for making turkey pop-up cards, a “Happy Thanksgiving” table greeting, a 3D “I am Thankful for my Family” sculpture, a cute reusable turkey stencil, and much more. 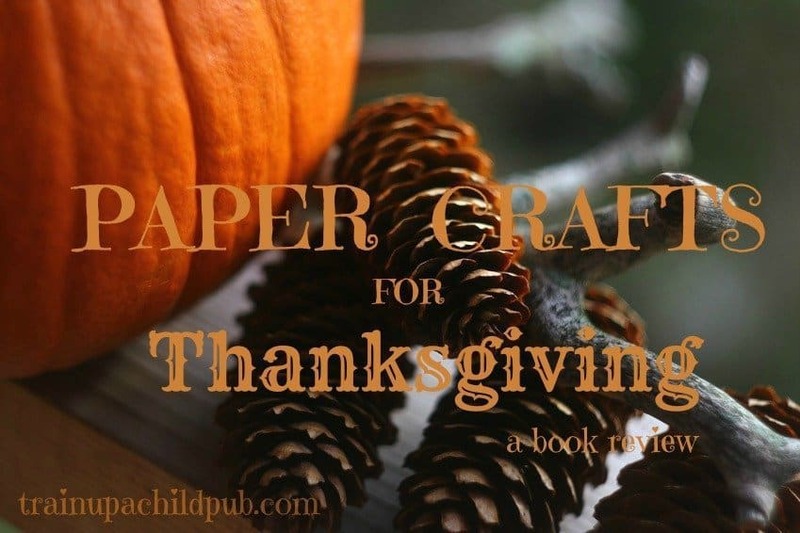 The book begins with a easy-to-understand history of the Thanksgiving holiday and suggestions for using recycled paper to complete the projects. In the “Read About” section at the back there are further book suggestions and website links to places where you can read more about Thanksgiving and see additional Thanksgiving crafts. Our hands down favorite project is the pop-up turkey card! You can see how simple the directions are in the image below. In addition the clear instructions, this is my favorite craft book for Thanksgiving crafts because of the really cute projects! I’d love to hear what you do with your kids to prepare for Thanksgiving! This looks like “my style” of craft book. My kids love crafts and have the “skills” (especially my girls), but I dread craft time. I don’t think I remember “ever” being good at crafts. I’m much more the analytic and other side of the brain! Trena, I enjoy crafts but need very good directions! That is one reason I’ve enjoyed this book so much — great directions and patterns. =D Thanks for stopping by!